We will apply our core competences in plant photobiological research to production environments in a project supported by the Academy of Finland’s key project funding. 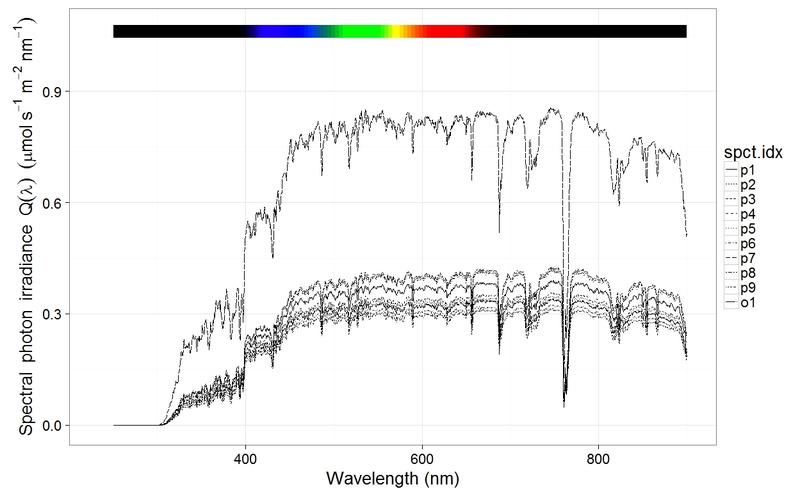 We will attune models of irradiance in controlled environments using measurements under practically-relevant scenarios to improve model accuracy in line with current approach for forest canopies. This will involve validation of site-specific modelled solar irradiance against precise on-site measurements for crop production, forestry and other photonics sectors. By incorporating these data into models that use environmental parameters to forecast yields and pest management etc., guidelines can be produced for optimising light conditions to specific purposes. Research will be done in sites across Europe and the USA. We will start by measuring light conditions in greenhouses and under polytunnels, and then develop and validate our model to work along varying conditions and environments. The graph below shows example measurements done at the University of Helsinki Viikki campus on a overcast afternoon in October 2016. p1-p9 are measurements taken inside a greenhouse compartment and o1 is a measurement taken just outside the greenhouse.